FORT WORTH, Texas — The Davey O’Brien Foundation today announced the three finalists for the 2012 Davey O’Brien National Quarterback Award, presented annually to the nation’s best college quarterback. Collin Klein (Sr., Kansas State), Johnny Manziel (Fr., Texas A&M) and Braxton Miller (So., Ohio State) were selected by the Davey O’Brien National Selection Committee, with the Fan Vote accounting for five percent of the total vote. The committee was asked to consider the following criteria: quarterback skills, athletic ability, academics, reputation as a team player, character, leadership and sportsmanship. The senior from Loveland, Colo. has quarterbacked the Kansas State Wildcats to the top of the Big 12 Conference and into the national spotlight. Through 11 games, Klein has passed for 2,306 yards and 14 touchdowns while rushing for 787 yards and 20 touchdowns, becoming the first quarterback at a Bowl Championship Series school to record at least 20 rushing touchdowns and 10 passing touchdowns in back-to-back seasons. Manziel has had a record-setting season. The redshirt freshman became the fifth player and first freshman in Football Bowl Subdivision history to pass for at least 3,000 yards and rush for 1,000 yards in a season, and his 4,161 yards of total offense are a school record. The dual-threat quarterback leads the SEC in rushing (101.27 yards per game), total offense (378.27 yards per game) and scoring (9.27 points per game). In his second season as the Ohio State Buckeyes’ starting quarterback, Miller has led his team to a perfect 11-0 record. He has proved to be a defense’s worst nightmare amassing 1,214 yards, which ranks him second in the Big Ten, and 13 touchdowns on the ground while throwing for 1,850 yards and 14 scores. 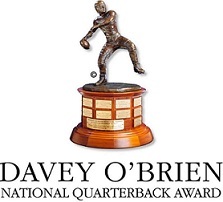 Fans may now help determine which quarterback will win the coveted Davey O’Brien Award by voting as often as once daily at www.VoteOBrien.org. Fan voting will close at noon (CT) on Dec. 2. This entry was posted in 2012, Awards by Travis Normand. Bookmark the permalink.